As part of our continued effort to improve your experience on the site as both a reader and writer, we’ve just added a feature that allows you to see what your Facebook friends have been liking and sharing on HubPages. In fact, it’s a “Recommendations” box you’ll find at the bottom right corner of every hub that shows the recent activity of your Facebook friends and other readers on HubPages. At the top of the box (if you’re signed into Facebook) you’ll see hubs that your Facebook friends have recently liked and shared. At the bottom, you’ll see the hubs that the entire community has been liking and sharing. Why are Facebook Recommendations useful on HubPages? Facebook plugins such as this are common on news sites because they allow browsers to get an idea of what the moment’s hot stories are and lead to relevant information. We’re trying to bring a bit more of that hot, cutting-edge content spin to HubPages.com, plus we’re also hoping to add even more of a community feel by allowing you to see what your Facebook friends have been enjoying on the site, even if they’re not hubbers themselves. We hope you enjoy the new feature. Let us know what you think! Ya, we love to hear that good news! Especially, it will be a convenient and two ways traffice for the Facebook friends know more about the HubPages.com and sharing hubs and hubblers…. I love this new Facebook feature added, I’ve thought of that before earlier on how it could be integrated on hubs as java script or widget. The viral nature of Facebook will indeed boost traffic across hubs with this plugin (Updates from Hubbers who are Facebook friends while logged in and the popular topics from HubPages shared on Facebook). Please include spiritual, religions category choices for us who are publishing hubs. I can not put some of my writing into that category because of the choices of your automatic system. This needs to improve. The person themselves should be the judge. The distinction between HP and a news site is that one organization holds the purse strings across a news site – it doesnt matter what appears in a recommendations/likes box as long as its within the site. Here at HP – the box will just provide distraction to our readers and will showcase mostly inane trending, entertainment related and poli-religious hubs. Its a traffic leak that is detrimental to the individual at HP and unlike other HP measures to spread traffic around , there is absolutely no “karma” aspect to it. I hope its effects are closely watched and when its proven itself as a dog, the feature is quickly taken out back and shot. I completely disagree with IIH. This will be an effective way to showcase Hubs to people who are Facebook friends with other people have have “liked” your Hubs. Sounds like a really awesome news. 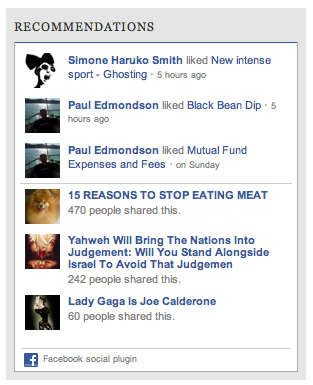 Facebook Recommendations help us know what kinds of hubs are best liked. I don’t like this at all. I hope it becomes optional so that we can remove it from our hubs if we don’t like it. I don’t know about other people but on my hubs it’s showcasing a load of junk. Well I hope you would disagree! I imagine the team had purpose and intent when implementing it. I also hope it does provide beneficial results to me. I also hope its effects are watched closely , readers are only as good as where they came from and how they leave – Facebook isnt currently an optimal source for either of those factors. It’s a great idea, as far as traffic is concerned. However, let’s see how well it goes. I really don’t mind the recommendations, especially when they are really important or of substance. What I do have a problem with is the fact that sometimes recommendations are not geared at helping people to solve any daily issue. Solutions to people’s problems, Educational and Entertainment recommendations I have no problems with. Anything other than these sometimes can leave hubbers like myself clueless. For example, asking me a question like”how can you kill a ghost”?????? I find more and more hubbers are joining and we do really have fun chatting, and appreciate sharing another’s work for exposure. But I think the group page I set up exclusively for hubbers only is tanking, any suggestions? Any? Maybe it’s just lame, cause really what would an exclusive group do for anyone they can’t do on their pages? I STILL fail to see how this is supposed to help me when my hub about travel through Connecticut has FB posts about Michael Jackson’s new album, Love Quotes, reasons to stop eating meat and Ruth McClung. I do not like this at all, and can see NO value at all to my hubs or y wallet. My vote is for an OPT OUT. Thanks for that – I was wondering what that was! I was also glad you pointed out the benefits, as I was too “thick headed” to really see it. After reading your explanation, it definitely is a big score for HubPages! I see why your Alexa rating is what it is! Good stuff. I think this is a great idea! I can see how it will improve the quality of our hubs.